Thanks to the found footage sub-genre, the horror movie community hardly knows what to do when the real thing comes along. At least that it sort of the premise of the new meta-meta mock-and-shock doc from the team behind the Holliston television series. 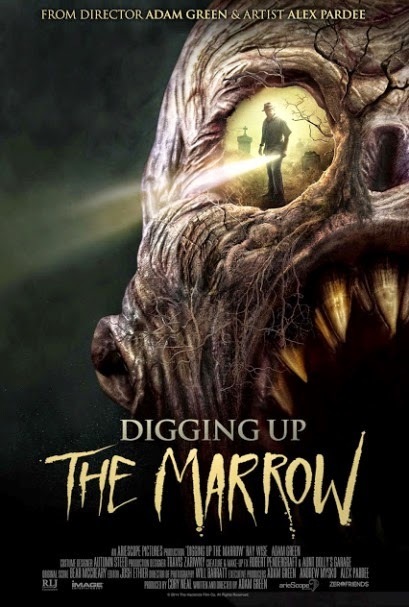 Director Adam Green, playing himself and riffing off his Holliston persona, starts to suspect monsters are real, so naturally he sets out to film them in Digging Up the Marrow (trailer here), which launches on VOD and opens in select theaters this Friday. Green really does get a great deal of intricately constructed fan fiction sent to him, in some cases much like the incredibly detailed but presumably barking mad missive that starts his on-camera excursion down the rabbit hole. A retired Boston cop named William Decker claims a secret band of the freakishly deformed live in a subterranean world he calls the Marrow. The entrances are closely guarded, but he has discovered one, logically located in an out of the way cemetery. Thus begins a series of futile stakeouts, with his reluctant cinematographer Will Barratt (played by cinematographer Will Barratt) in tow. Of course, just when Green decides Decker is a complete nut leading them on a wild goose chase, they finally see something that changes everything. However, they still have to convince their colleagues to take their footage seriously. Green’s real life editor Josh Ethier (who also played the killer lumberjack-alien in Joe Begos’ Almost Human) is particularly skeptical, but he is perfectly willing to cut Green’s stolen shots. “It’s not found footage, it’s . . . footage” he insists. Frankly, this is one of the best postmodern self-referential genre films since Wes Craven turned his signature franchise on its head with New Nightmare. It is light-years better than the Vicious Brothers’ knowing but disappointingly flat Grave Encounters 2. While there are plenty of creepy moments, the film is more about exploring how the horror industry and sub-culture would respond when confronted with possible evidence that maybe some of this stuff might just be real. In a pleasant turn of events, Ethier and Hatchet star Kane Hodder (best known for his stint as Jason in the old school Friday the 13th films) are totally hilarious playing off each other and Green. They give the film a major energy boost during their scenes. 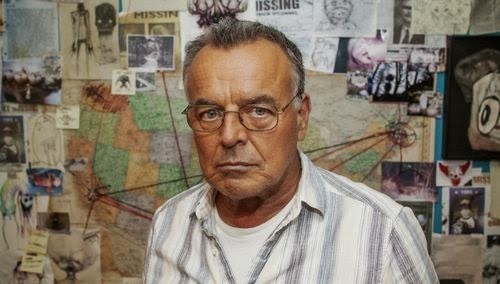 Green himself is a good sport as the straight man for their quips and all of Decker’s macabre madness, whereas Ray Wise, the only cast member assuming a fictional personal, is reliably looney as the unreliable Decker. Inspired by the Alex Pardee’s monster art, Marrow is a strong creature feature that might even be more interesting when it operates in the ostensibly real world. Sadly, the film also marks the last screen appearance of Green’s late series co-star Dave Brockie. Green also was disciplined enough as a director to keep the scenes of actress Rileah Vanderbilt playing his actress-wife Rileah, even though she would now have to play his ex-wife should there ever be a sequel. Given all that seems to transpire, fans will not be expecting a third season of Holliston anytime soon after watching it, but they should enjoy appearances from leading genre filmmakers like Don Coscarelli, Mick Garris, and Tom Holland. Highly recommended as a clever, fully developed, ironically meta genre film, Digging Up the Marrow hits iTunes this Friday (2/20).